“There is a way that seems right to a man, but in the end it leads to death.” Proverbs 16:25. Recently the skull and crossbones symbol has caught my attention. While visiting one of my relatives, I saw its image displayed on various items around her house. I next noticed it as a pendant beautifully displayed around my pedicurist’s neck as a jeweled object. Then, while holding a puppy I noticed there were multiples of this image printed on his collar and behold the same jeweled image appeared around his owner’s neck. So I decided to do some research as to its symbolic meaning. I guess the symbol could be displayed on most anything as I’ve seen it online printed even on baby paraphernalia. In my research, the one meaning that is paramount is “death”. So why would we proudly and willfully display the death symbol in our homes, on baby articles, wear it as jewelry, and tattoo our bodies with a symbol that means death? As a Christian, I was also surprised to discover religious organizations have displayed the symbol beneath the crucifix. What is interesting to note is that Jesus’ crucifixion and death took place in Golgotha which means “the place of the skull”where many men suffered and died. So what is its significance, if any, and why is the symbol popular today? I believe that for most people it is just “trendy” to wear the symbol. If you ask anyone why they wear it or display it they will usually give you no reason. At the same time, I remember being appalled witnessing the Christian cross worn by the pop vocalist Madonna when her hit record “ Like a Virgin” was popular in the 80’s. The cross displayed between her cleavage was to me a mockery of what I held dear. And then I note many even today continue to wear the cross not in mockery but in ignorance as to its spiritual significance. I came to the conclusion that to the trendy both symbols have no meaning. But to the believer it displays their life’s faith. Believers who attach spiritual meaning to the Skull & Crossbones may be expressing,“ Seize the Moment”, or “Eat, Drink, and be Merry for tomorrow I may die.”; noted in the film (Dead Poet’s Society). Whereas on the other hand the Cross to the Christian means triumph over death and eternal life through Christ’s sacrifice. “I am the way and the truth and the life. No one comes to the Father except through me. John 14:6. We can’t ward off evil or conger up its power by wearing a symbol. Neither can we have eternal life by wearing a cross , going to church or praying the rosary and reciting “Hail Marys”. The only Way to live positively ( John 10:10) is through Faith in believing in God’s only Son, Jesus Christ, who conquered death and sin for us through His own death and resurrection. This entry was posted in Current Events, Faith Messages and tagged Cross, crossbones, crucifix, Dead Poet's Society, death, faith, Golgotha, Jesus Christ, Proverbs 16:25, Skull. Bookmark the permalink. 50 Responses to What’s Behind the Skull and Crossbones Symbol? Thanks for being a good blog friend.You are greatly appreciated. The person who has come to faith in Jesus Christ by confessing their sins and accepting Him as Lord and Savior, is a child of God. And you are correct in stating there is nothing that is powerful enough to separate us from His unconditional love. So with this knowledge we also want to please Him and represent Him truthfully in all things. I believe this is your desire, since you are questioning the association of death symbols and also your involvement with virtual games which involve simulations of killing an opponent. For example: a cross can have many meanings to those who wear it. To one, it may remind them of Christ’s death on the cross and their salvation through faith in His death. To another, it could just be a piece of jewelry, with no meaning to the wearer, other than it is faddish. But to the one who believes that by wearing the cross, it gives them protection, then it becomes a talisman- (an object held to act as a charm to avert evil and bring good fortune) which scriptures warn to avoid. Wearing a cross does not have the power to protect nor ward off evil. Faith in Jesus Christ and his sacrifice on the cross enables the believer to overcome temptation through the power of His shed blood which covers all our sins the moment we repent and believe and confess Him as our Lord and Savior (Romans 10:8-10). Now as for what would God have us to do concerning these things, let’s refer to the Word of God. So, we should ask ourselves, does this please and honor God, this thing I say or do. The Word says we are to be occupied with the things of God. We can be occupied with things which bring us closer in relationship with Jesus Christ, or we can be occupied with the things of this world, to the extent, our minds are influenced by them, and we no longer represent Christ. That is why it is so important to pray concerning everything, and to study the Word of God so we can know the things He would have us do. When we accept Jesus Christ as our personal Savior, we receive His Holy Spirit, The Holy Spirit transforms our mind to think like Jesus Christ. The Holy Spirit will prompt us when we are occupied with anything which is not of God and could harm us. Therefore, It’s important to pay attention to those promptings. I have been told that the reason for the Skull and Crossed Bones was because in the time of Jesus and prior, when a person died, their body was left to decompose until all that was left were the bones, which they would then put into a box, however, the femurs were too big to be put in straight so ended up being crossed, then finally the skull would be placed in the middle at the top. Hence, Skull and Crossbones. This practice was carried on prior to the Templars and Pirates, the earliest being Tristan Da Cunha, who sail out of Portigal where what was left of the Templars protected in return for letting them berth there. He decided in repayment that he would go off and plunder other countrie to pay for his keep, so to speak, It was on one of these raids that as he was returning he was attacked by pirates who then discovered the symbol of the bones and adopted it as theirs. Also he scuppered on of his ships to stop them from getting the gold and other goodies. There is a lot more to this story than meets the eye. Brian Walton, PS My address is Knight Templars in Dover, right next to the remains of a Templar Church. I don’t know why you give a skull and cross bones such power it’s just a symbol I’ve had one since 18 years old in the form of an army tattoo I’m christian and been my whole life it hasn’t lessen my spiritual or my daily prayer life it was a thing of my past I was saved when I got it Jesus is the symbol of life and no other is stronger than His love for us let em wear whatever on the outer man it’s not a problem for our GOD he’s fixing us from within without. Dear Bernard, Exactly my point. It is what it is depending on how you want to use it. Still would like to know WHY the skull represents our Troops, could someone please email me a answer! I am Scottish and I am amazed that most people here do not know why we have this symbol “Remember man thou art but dust and to dust thou will return” . Hi I recently found this blog. I know someone who is a Freemason and they tend to have the skull and crossbones as one of their famous symbols. Do you know why they use the skull and crossbones at all? I know that the majority of Freemasons are Christians. Also it is usually surrounded by a cross with the words “In Hoc Signo Vinces”. Alternatively it is sometimes in the middle of the square and compass instead of the usual “G”. Is there something sinister to all of this? Check out the links that I have sent to see what I am talking about. Pirates have nothing to do with God. We are to be transformed by the renewing of our mind. We are not to be of this world. It is not good to justify yourselve to make you feel good. Give God the glory and all of the praise through whatever you do. Dylan, The Skull and Crossbones symbol has nothing to do with Freemasonry. The Freemasons do not have it on any of their symbols. The letter “G” in the center of their symbols means “Goodness” . Therefore, creating this symbol using the crossbones is a complete contradiction and misrepresentation of the origin of their symbol. The square means “virtue”, and the compass means to keep one’s passions within limitations and not to be controlled by them. 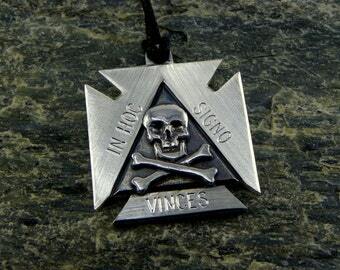 The words,” In Hoc Signo Vinces” is a Latin phrase meaning, ” In this sign you will conquer” originating from a vision Constantine had of a bright cross giving confirmation to embrace Christianity. Cults and organizations will sometimes adopt ancient phrases and symbols to create their own. Persons will wear symbols they do not understand because it is faddish. Just like we see many displaying the crossbones symbol on their clothing and jewelry,as I mentioned in my blog. Freemasonry is an ancient secret society which does not openly reveal their rituals to the general public, but in its origin it has never associated itself with anything evil, quite the contrary; it is a group of men who vow to the commitment of virtue and morality based on scripture. However, it is not to be confused with Christianity, as it’s foundation is on “good works” rather than faith. Christians are justified by their faith in Christ Jesus and not their works (Romans 5: 1-2, Ephesians 2:8). There are Christians who may join the Freemasonry society for social reasons rather than doctrinal. But if anyone believes by joining any church or organization it will put them in good standing with God, they are deceived or ignorant. It is only through faith in Jesus Christ’s death and resurrection for the forgiveness of personal sins, one receives God’s salvation. My husband who once was a member of the Freemasons, confirms to me the crossbones symbol has never been displayed with any of their symbols. However, since each lodge is independent, the particular lodge your friend may be associated could have adopted the symbol in ignorance. There are movies and documentaries representing false accusations of Freemasonry as a cult and mystic society. This is false. But there may be organizations forming that try to adopt their symbolism and create their own secret society. Why your friend has these symbols I do not know. Perhaps you could ask him. Dylan, I hope my response has helped and thank you for your inquiry. May you grow in your knowledge and faith in Jesus Christ whose symbol is His sacrifice- the Cross. OR: As with a childs ‘pirate map’; ”X” marks the spot(at least since i aas a kid in 1960s). To target/draw focus. ‘…and to dust we shall return’ -death provides the reference for which life often is defined. If nothing else; A reminder of natural law. I have a Question. My favorite football team the Tampa Bay Buccaneers they have the skull and crossed sword. My wife told me while we were dating to stop wearing the Logo and wear the Vintage Bucs Logo she feels better about. Can you help me understand its just my fav Football team. Is it wrong to wear the team stuff and not like the team as well. It would depend entirely on your own conscience and not mine. According to the Apostle Paul when there was a debate over whether or not Christians should eat food sacrificed to idols he mentions that in such matters, although it is permissible it may not be beneficial. Because, while it maybe permissible according to our own conscience, we must be careful to not do anything that might cause another Christian or even a nonbeliever to stumble. If you are in Christ Jesus it will be a matter between you and the Lord as to whether or not displaying the symbol is beneficial to your witness in Christ. Thank you so much for explaining the skull and crossbones, I now have a better understanding of it’s different meanings. The only problem is, is that I still don’t know where it originated and why it actually came to be in the first place. Robert , thanks for your comment. View the links I listed following the article. I believe u will find out more about how it originated from these resources. Hope this helps. I So agree with you I have researched over and over on the subject because it bothers me so badly that my own children put t-shirts on my grandbabies and fill their house up with this evil! Thank you for your article. I’d love top see your opinion on monster high evil dolls! A sign of protection against the evil ones coming against you! I am not sure what you mean “a sign of protection against the evil ones coming against you”, but if you believe the symbol of the skull and the crossbones can ward off evil, you are mistaken. The only thing one can do to ward off evil is to have faith in Jesus Christ who destroyed the evil one by His sacrifice on the cross. The sign of His victory is His resurrection. All those who have faith in Him for the forgiveness of their sins will not remain in the grave, but upon His return, will also be resurrected. Evil does not protect against evil. As Jesus said, a house divided will fall. I pray you will read the gospel of John and be enlighten with His truth. I am praying for you. May the Lord open your eyes to the Truth and God’s salvation through faith in Christ Jesus. What will you say to a child who thikinds that skull bones are not demonic? Skull bones are not demonic. It’s how they are used or portrayed as symbols for the superstitious and for those who believe the symbol has the power to ward off evil that makes them a form of talisman. As my article explains there are many interpretations as to its meaning, nevertheless, there is definitely a trend of displaying it on most anything. So the crossbones and the skull are not evil in themselves. It’s what’s behind its usage and display that will determine that. Otherwise they are just bones without meaning unless you attach meaning. Ask the child what he/she thinks it means and why? Thank you for your question. Hope this helps. He said it is just a picture but i do not believe because all his friends have the same picture on their profile, thank you for answering my question. Tim,it is what you believe and your faith that’s important. God can use even this to explain His gospel. Just as my blog explains that Christ won victory over death, you can testify of your faith not in superstition or something as a graphic warding off evil, but an opportunity to lift up Christ. You can point to the cross and bones as the wrong way, and Christ’s death and resurrection as the right way. We all do things through ignorance, now that you have the truth, tell it. Use the tatoo to give testimony of God’s great love and victory over death. God can use it for good because we know all things work together for good to those who love Him and called according to His purpose. Also, remember in our confession of sin, we are also, always forgiven. Therefore there is no longer any condemnation to those who are in Christ Jesus. Romans 8:28, Romans 8:1, 1 John 1:9. There are things Satan means for evil which God can use for good. Use the tatoo as a way to explain your faith in Christ. God will give you wisdom when you pray. God’s blessings, brother. Lisa, you are not alone, I believe we all at times send double messages. I have done so myself. The important thing is when we know it does not please the Lord, we acknowledge it as you have done so. The Lord will bless you for not compromising your convictions. Thank you for your comment. Awesome article. It helped me explain why my younger son should not wear a skull and crossbones t-shirt. We are Christians and I am teaching them not to blindly follow trends or What someone tells them but to research it for themselves and listen to the holy spirit as guidance. Blessings! Thank you for your comment. I did allow my children as teenagers to display Madonna and the cross and my son to own a skateboard with the skull and crossbones. In other words, I compromised with the culture of this world. There were consequences not directly related but allowing these things to come into their life with my awareness, even though I spoke against evil, was detrimental to our relationship and their spiritual growth. I repented and God forgave me, but I still live with the consequences. I believe God wanted me to research this symbol so His people would not fall into the same trap as I did because of my compromise. Let’s pray for our children and grandchildren according to the Lord’s prayer: “And deliver us from evil”. Amazingly, my children remain in faith in Jesus Christ, because of His grace and as a result of abiding in His Word and prayer. Sometimes we compromise because the world’s influence is more dominant in our life than God’s Word. Certainly, that was the case for me. Now, first thing every morning, I get up early to pray and meditate on God’s Word. It’s through His Word we gain knowledge, wisdom and strength. Through Prayer we have fellowship with the One who gives us victory over all temptation and fear. Don’t compromise, Juanica, God will bless you with His Peace and Joy. I recently found a Crucifix that hung over my moms bedroom door. 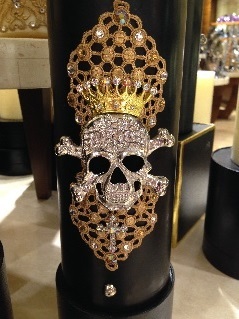 I was shocked to see it has a skull & crossbones on it. Can you offer me any suggestions on finding it’s meaning? Thank You for anything you can advise me of. Thank You very much! My name is Mary and I am the only one writing the articles as I feel inspired to do so through research and meditation on God’s Word. Thank You for your comment. In the management section of WordPress, I believe I indicated allowing search engines to access my blog. Also, I believe the tags are instrumental in finding my blog when readers research the internet. I hope this helps. Heya i am fоr tɦе firѕt time heгe. I came across this board anԀ I in finding It rеally helpful & it helped me out mսch. Ι hope to provide sometɦing baϲk and Һelp օthers lіke уou aided mе. I hope you can provide something back and help others through your sincere knowledge of the truth and faith in Jesus Christ. 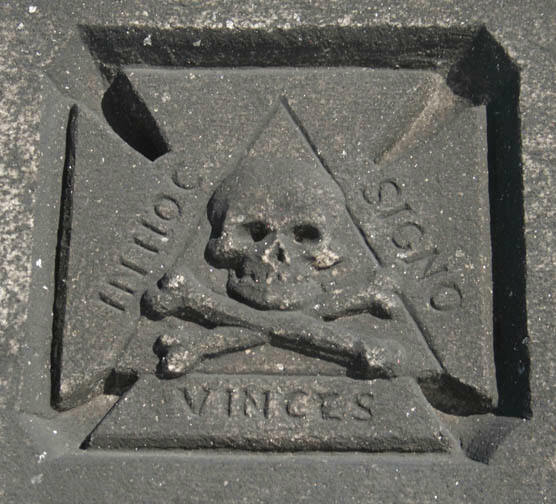 There are many graves in Italy, even in the cathedrals with this symbol. Normally some of the older graves could have the symbol. I can forward a picture of such a grave. Looking forward to seeing those graves with the symbols. Thanks for responding.